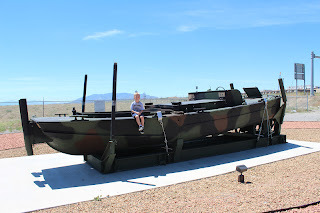 This afternoon Dustin, Glen, and Zach took Thunderpig out for a drive and ended up at Camp Williams. 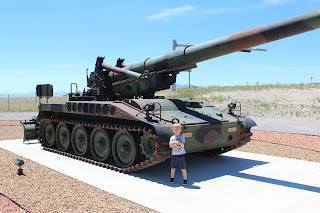 Glen and Dustin had fun showing Zach all of the cool Army vehicles they used to work with during their time in the Army.. Zach really enjoyed climbing around on everything. His only complaint was that he couldn't hear their engines.. hah.. what a boy. Zach and Grandpa standing near a helicopter.. We see these flying over our house a lot. It was cool for Zach to see one up close. 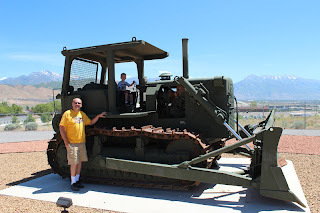 Grandpa and Dustin were excited to show Zach this bulldozer. 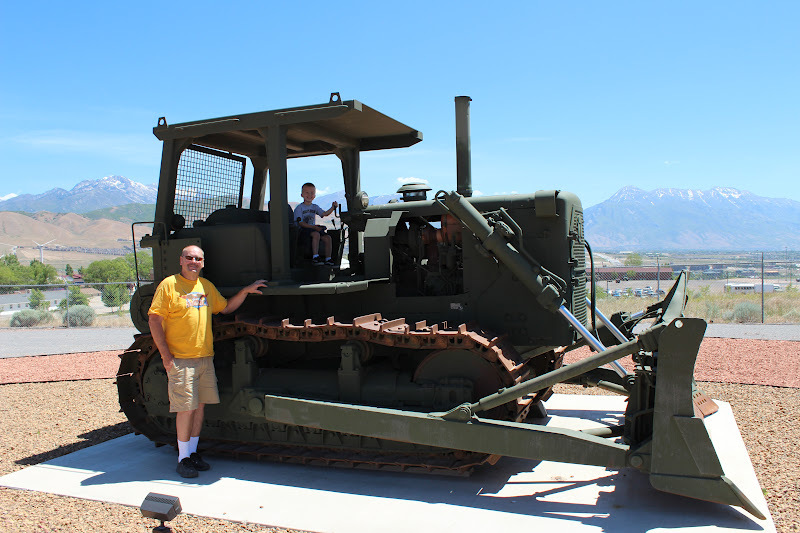 Its the same type of bulldozer that Glen let Dustin ride with him one winter as he was clearing snow with.. Dustin was probably about the same age as Zach is now..
After looking at all of the army vehicles they drove onto base and Zach waved at all of the soldiers. 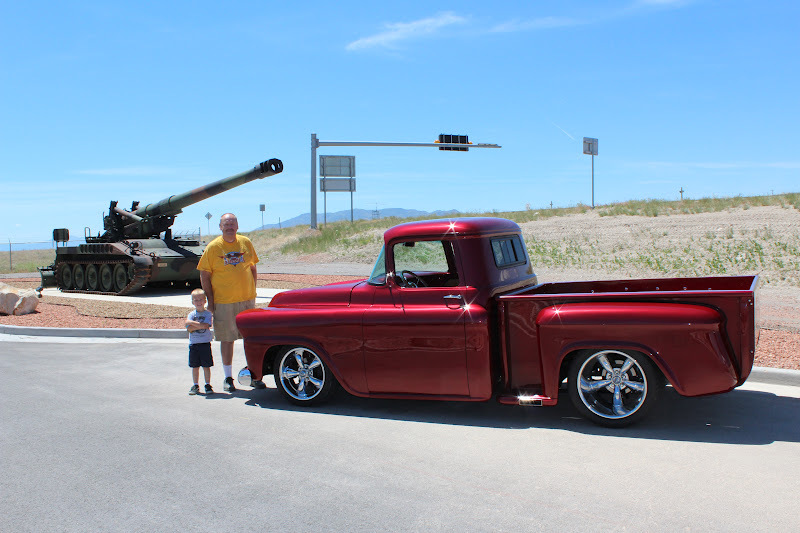 What a great day for a drive! Time for Zach to get up and about and shower. We are suppose to keep his ears dry for a week or so post the surgery....so it was time to whip out the old ear cover we bought for him to use at the pool with his last set of tubes two years ago. 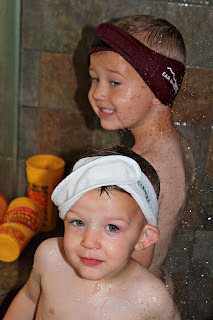 Logan saw that and HAD to do what his brother was doing....so he searched in our bathroom drawers and found one of Jen's headbands she uses when washing her face to keep her hair back. Logan was happy....so I guess we are as well! 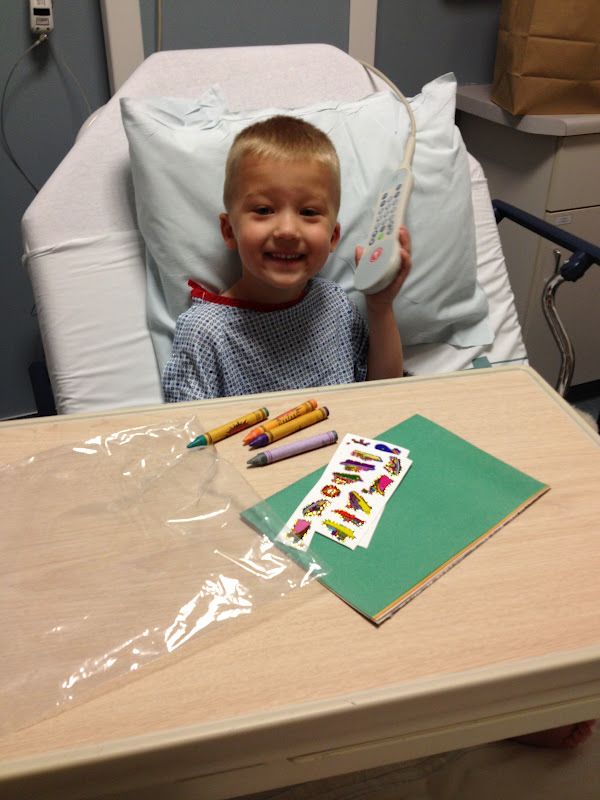 Today was Zach's ear tube and adenoid removal surgery. ENT#2 was doing the surgery at the Utah Valley Medical Center in Provo. We were suppose to be at the hospital at 7am, which meant we needed to leave our house by 6:15am. Grandpa Gray graciously offered to watch Logan at our home while we were with Zach at the hospital. Zach had no idea what he was in for....in the end neither did we. Last night we told Zach we needed to go to Provo today early in the morning. We explained it would just be mom, dad and him going - he was super excited it was just us and no Logan. 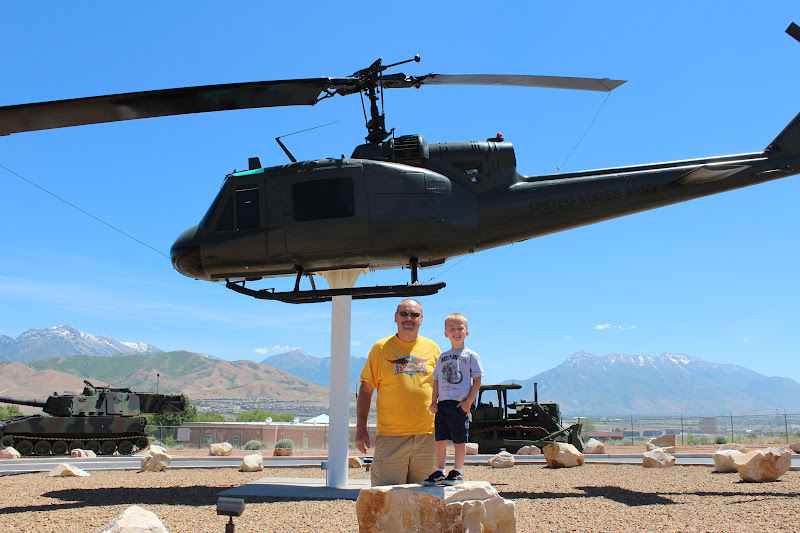 He kept saying, "I am going to Provo with Mom and Dad!". So this morning when we exited the freeway in Provo Zach asked us, "So why are we going to Provo?". Dustin and I just looked at each other. Jen explained to Zach that we were going to see the ear doctor and he wanted to put the tubes back in his ears to make them stop hurting him. Zach physically knows what ear tubes look like because he saw both of his last pair fall out. Jen remembered the first set of tubes Zach had were blue in color - so she tried to make the tube event 'fun' and tried to make Zach guess what color his new ear tubes would be...and tried to convince him to ask the doctor. 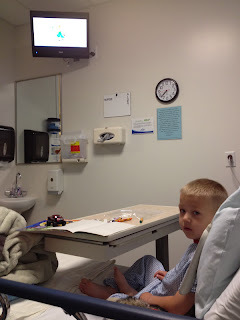 We arrived at the hospital and Zach was starting to get worried, because the last time he was at a hospital they took blood and he didn't want his blood taken out. We explained no blood was being removed this time. We checked in and Zach was still pretty cautious. The nurse we were assigned took all his stats, and showed us the 'room' Zach would be in pre/post surgery. She gave him stickers, paper and crayons and showed him he had his very own TV in his room with a remote! We got Zach to change into his gown. The nurse then gave him some purple drink that was suppose to make him drowsy...boy did it ever! He was a happy, giggly, very relaxed boy. The ENT and the anesthesiologist both came and met with us to explain what was going to happen and answer any questions we had. At 8am they wheeled him away for a 30 minute surgery. We read magazines, played on our phones, tried to make chit chat as we waited and waited and waited for them to bring Zach back. We knew what to expect when Zach came out of anesthesia from his first ear tube surgery two years ago (a non stop crying kid). What we didn't expect was for the nurse to come to us at 8:30am (when we thought Zach would be getting out of surgery) to tell us the ENT was on the phone in the OR and he wanted to talk to us. We both had a look of panic and the nurse could tell - she said, "the doctor wants to talk to you about his tonsils". Jen walked over to the phone and talked with the ENT - he was recommending Zach's tonsils come out. Apparently Zach's right ear (the one he keeps getting infections in this last round) was pretty bad. It was full of so much thick gooey fluid. When the ENT removed Zach's adenoids he wasn't convinced the ear problem was strictly due to the adenoids. Zach's tonsils were swollen during surgery so he recommended they come out while he was already sedated to rule out any interaction with his ear problems. Knowing Zach has had strep throat twice in the last year, and when he does get strep throat he gets severe sleep apnea we agreed with the ENT and had Zach's tonsils removed....as we expected they would have to be removed in the next couple years anyway. We had another 30 minutes before Zach would be back to us. 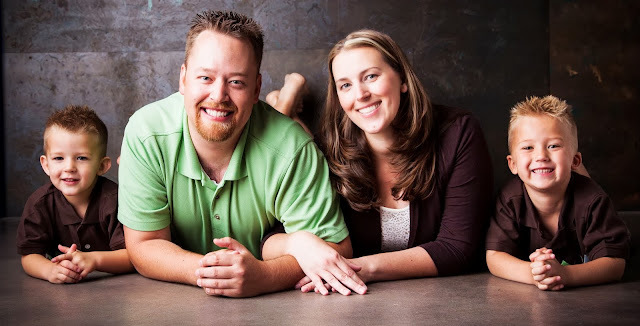 We were still in a state of panic - we were prepared for a three day tube/adenoid removal recovery. We were not prepared for a two week tonsillectomy recovery. 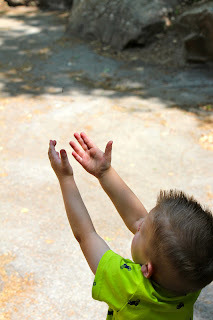 We spent the time scouring the internet on what to expect for a tonsillectomy recovery in a four year old.....our hearts sank at what we were reading. Zach made his way back to us - in the non stop crying and inconsolable state we expected. He just kept complaining of his throat. He kept trying to clear his throat and force himself to throw up because he felt like there was something stuck inside. The nurses tried anything and everything to get him to drink. He did have some water, and a slushy. After an hour - literally an hour of Zach crying, whining and not calming down they said he was free to go. He drank and had normal stats. We were discharged. 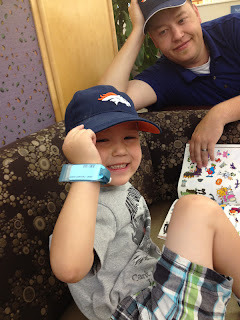 Sure enough as soon as we walked out of the recovery area in the hospital - Zach calmed down. His poor face was so swollen from being upset (and probably some from the surgery). Soon after we got in the car to drive home he fell asleep. We were in no hurry to make it home as long as he was asleep. Zach was pretty calm the rest of the day. He chilled on the couch. He drank what ever we would give him. He wouldn't eat. He took the pain medication easily, which made things bearable for all of us. We watched movies. We talked about things that would spark his interest. He got a kick out of his dog stuffed animal he brought with him to the hospital. 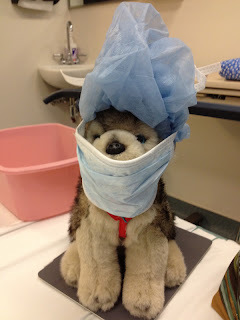 The hospital staff dressed the dog up when Zach went to the OR. We had a few visitors stop by with balloons for Zach. That brought a BIG smile to his face! 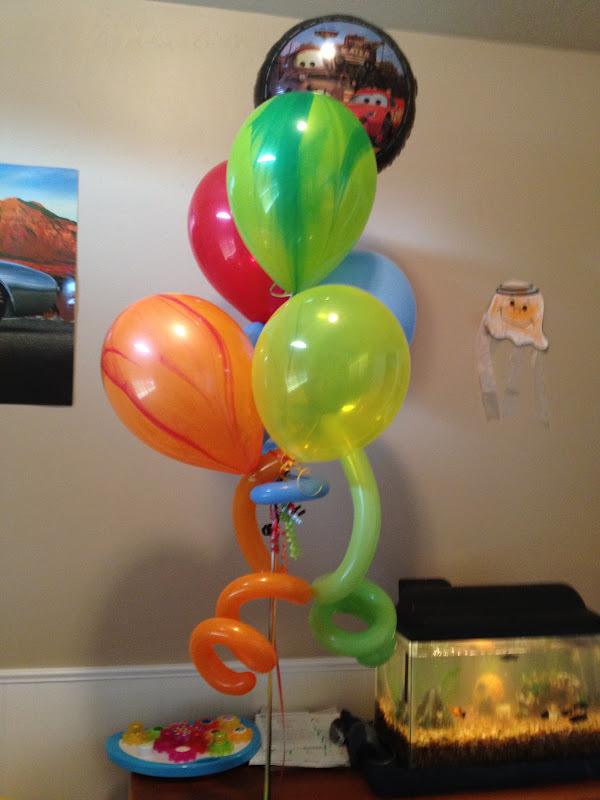 Grandma Twogood had one of her good friends that lives in the area drop off these balloons for Zach. Dustin's co-workers also all pitched in for balloons and a big bag of candy for Zach to eat when he felt better. Today as absolutely beautiful. Once we were done with work we decided it was a dinner in the park kind of night. 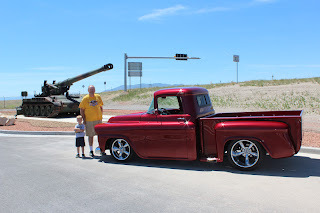 We picked up the kids from daycare and went and picked up Grandpa Gray from our house. The next stop was Jimmy Johns for some sub sandwiches...and then finally the nice, shady, un-crowded park! Today is preschool graduation day! 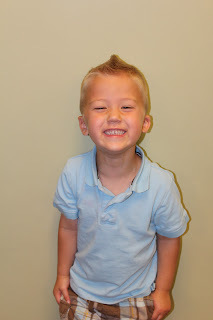 Zach completed the 4 year old preschool class at Avondale Academy. He has loved his teacher and his classmates. Zach knows all this ABCs and his numbers up to about 20. Zach also loves to sing and dance and has turned into quite the ham! Zach with his partner in crime - Beckham. Beckham is two months younger than Zach. They are in the same class at church and Beckham lives down the street from us. See - what did I tell you....a couple of characters showing us their best during the graduation ceremony. The woman in the middle is Mrs. Madsen. She was Zach's preschool teacher up until one month ago when she had her first baby. The woman on the right is Mrs. Rue - she took over the class for Mrs. Madsen. The solo song Zach had for his graduation was called "Gus the Goat". The big glasses are the prop Zach used during the song. He LOVED it. Enjoying some snacks at the end with his classmates. The boys are LOVING having Grandpa Gray in town! Wresting in the basement is becoming a regular occurance. Grandpa Gray is really good at catching both boys at the same time! I think this 'holiday' should happen in the middle of the week. Yes - a 'holiday' that everyone has off work....so it can be a real day of rest for Mothers....not a day of rest that is already deemed a day of rest. My Mother's Day started with a 5:30am wake up from Zach. His stomach didn't feel good and he wanted to sleep on the floor in our room. My first response in my half woken state? It was "can you go lay on the couch in the other room?" Not very Motherly was it. Dustin walked Zach in to the other room and stayed with him so I could get another couple hours of shut eye. Around 8:30am I woke up and found Zach still chilling on the couch (apparently he did throw up about 6:30am and felt fine ever since), Dustin making breakfast and Logan glued to the TV. We ate the yummy breakfast and then the kids were DYING to give me my Mother's Day gifts. I have to five props to Dustin on this one....he had taken the kids out individually on different nights last week to specifically shop for my gift. He let them pick 100%. Zach decided I needed some girl bows for my hair...and then decided I needed a girl hat to go along with it (think Michael Jackson hat, but hot pink and sequenced). Logan decided I needed two bags of dove chocolate (that's my boy! ), the Princess Bride Blu-ray DVD and a package of Top Ramen. The daycare center our kids go to had given us a DVD from Zach's room for Mother's Day. We spend the next hour watching it. It was a slide show of all the activities Zach's class has done for the last 6 months. The music that was on the DVD while the pictures were changing were all the songs Zach sings and dances to at daycare. We had quite the show going on in our living room - both Zach and Logan were dancing and singing! 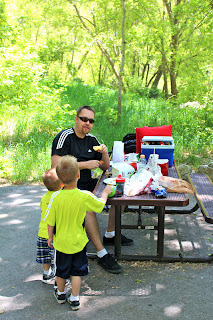 Next we decided to pick up some KFC for lunch and take it to the American Fork Canyon for a picnic lunch. The weather was perfect for it. So off we went. We found ourselves a nice little picnic location not too deep into the Canyon. There was lots of trees, greenery, river, and rocks for all of us to take in. The kids were too excited to explore that they didn't really eat any lunch. It was a good time. Not as relaxing as we had planned on it - always making sure you have an eagle eye on each kid at any given moment. We didn't want them to find wild animals and start playing with them...or try and run directly into the fast moving freezing cold river....but very enjoyable. So much enjoyable that we bought a yearly pass to enter the Canyon. I foresee many summer evenings spent up here. The rest of the day was a blur. There was some playing out in front of our house with the gator, left overs for dinner, and IronMan 2 on the TV to enjoy in the evening. Today we saw a new ENT specialist for Zach. The appointment went as we expected. The specialist looked in Zach's ears and said the right ear drum had healed from its rupture two weeks ago but was still full of fluid. He agreed that Zach needed a second set of ear tubes and recommended removing his adenoids. What else could we do? We've tried restricting his diet from dairy. We have had Zach allergy tested (no dairy allergies). The continual fluid build up will just cause his ear drum to rupture again, and again and again. So - we are moving forward with the surgery - May 25th (intentionally this date to give us extra recovery time during the Memorial holiday weekend).